The Final Coleco Adam Computer System. If you have anything relevant for these Coleco ADAM sites, like Pictures, Tests, Reviews or other. Please send text and attacked pictures to the ColecoVision.dk email. The CBS ColecoVision console expands into a powerful Family Computer System by the addition of Expansion Module No. 3. 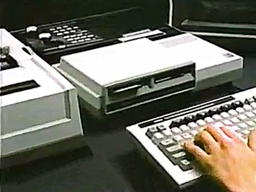 The CBS ColecoVision Family Computer System is designed to think like the user, not like a computer. So it is designed provide all family members with easy to use programmes as well as excellent games and most importantly, built-in Word processing for letter and report writing. What you get with CBS ColecoVision is a complete Family Computer System. 75 key sculptured, stepped keyboard. Memory Module which has an in built Word processing programme, which can stor the equivalent of 250 pages of text. 80 column letter quality printer for use in word processing, or as an electric typewriter. By linking with the 16K byte Ram of the CBS ColecoVision game console. and sufficient for all your home computing and entertaiment needs. The interactive microprocessors in each of the Modules enable high speed efficiency in all computer operations. The CBS ColecoVision Family System is easy to use which makes it suitable for everyone. Special keyboard keys and the built-in Word processing programme make learning so easy that the user could prepare, edit and print a letter within a few hours. Detailed instruction books are not necessary as the computer guides you, step by step. A Danish Magasin Alt om Data, wrote: "Gambling on a high level". Adam's time in paradise is over. Wednesday the 2. January 1985 announce the founder, Coleco now Hasbro, and Infogrames a totally stop for the "family system Adam". But believe it or not, Coleco could be found on the CES-show with a big place and a lot of advert in all local magazins. 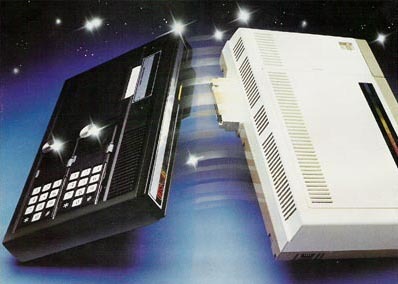 Coleco presented Adam at the summer CES-Show in 1983, the system was planned for a Danish release, but it never arrived into Denmark. The system came complete with a Keyboard, Desktop, 1 Cassette-data station and a big Software package. ADAM has a buildt in texteditor and a typewheel printer. Alltogether for a price on $ 599,-. On reason of this aggressive price calculated many experts that, Adam quikly vill overtake worldwide. But like before, costummers have to wait in long time, before Adam arrived -and that for a $ 100,- more. In 1984 has Adam a slow sale, and what do the desperate ? Coleco affort its costumers money !. Before christmas 1984 came Coleco with an offer, where the buyers in the next year would receive a check on $ 125,- All in all $ 500,- for progresive education. But it do not help, and nor a "last moment offer" about you could get a free Cabbage Patch Kids doll if you buing an Adam. Cabbage Patch Kids could in US geting in many variations suchs like Cowboys, Clovns as well as Twins. Coleco burn their fingers a lot with ADAM. First was it the name ADAM, a Califirnia Computer manufacter called Logical Business Machines said they already own the rights to the name of Coleco's new home computer. Coleco said they had no discussions with Logical about the conflict, and Coleco had not received any communications from LBM. In 1983 calculated Coleco with a sale on around a ½ million units, but with the end of the year was there only afforded around 100.000 units. All together has Coleco lost between around 200 and 300 million of Danish crowns (Kr.). Coleco Adam had also a big error on their ADAM Computer, over 60% have to go back to Coleco for failure in the hardware. After the bankrupt goes a lot to Milton Bradley and Parker Brothers. Telegames and e-Coleco bought also a few rights. As you can see, ColecoVision are included in the Memoryconsole. Much much better!, and note that! The Memoryconsole has the AV Out. And what could that ADAM computer ?. Text on screen: 36 characters on 24 lines, 80 characters with monitor. 3 soundchannels -5 oktav and 1 white noise. 4 Parallel BUS ports -3 intern og 1 extern. 1 x Digital Cassette Drive, 1 activ and 1 passive, the prototype with 2 x Super high speed Wafer Drive. ADAM NET Port for accessories. Colecovision has on the presentation in 84' ADAM as Expantions module #3. The memoryconsole had to use Colecovision as a necessity. Coleco Industries relaunced quickly a new model, where Colecovision was build in the Memoryconsole. To late seen for the designers, but you get of with a depth table. 10,5 stroke pr. second, Ca. 120 words on a minute. wrote in both directions. Friction Feed Standard. Was launched with 2 Typewheels, namely Daisy Wheel & the font Pica 10. Also 1 black ribbon was included. The printer itself was a very strong machine, it was fabricated in the land of Ireland. Note: The power supply are placed in the Printer. Super Buck Rogers game cassette. Pica 10 & Daisy Wheel typewheels. Instruction in Basic & SmartWriter. Various cables and 2 white Coleco-controllers. ADAM Memory console, all prototypes only for demostration. ADAM none working prototype # 1. Super High Speed Wafer Tape Drive, prototype. A kind of stand alone, but needs to be connected to the ColecoVision expansions-port. But the time was already running out for Coleco Adam, only 2 years on the market. None Adam computer was sold here in Denmark, it was a land of Apple II, Commodore, Spectrum, Oric and Amstrad which was the favorite brands. CBS Electronics in Vanløse, Denmark did the sale and marketing, try to do some commercials for Adam, but ADAM was a kind of clumsy. In the mid 80s, was almost all home computers small, and had built all the electronics underneath the keyboard. Coleco started as an leatherfactory, became later a Toy factory, and lost everything with the American videogame chrashes in the mid 80's. Sony (Columbia) made later a CPM "Hit Bit" -With a lot better design. Technical is it a Coleco/ADAM (MSX). A further development of MSX with smooth control and more memory. Did you know that: CBS (Columbia Broadcast System), was the distributor of ColecoVision in Europe. CBS is a part of SONY (Columbia). Sony made after their MSX adventure the game console Playstation 1, as there are millions of -now on days. Playstation was a cooperation together with Nintendo, but Sony took over, and Nintendo started their own console. So after the U.S. game crash in the mid-80s, was it Nintendo NES 8 bit. who took over where Coleco left off. From 1985 until 1995, (2003 for Japan) sold Nintendo Intertainment System over 61.9 million consoles worldwide. So who say the overcrowded market for games would crash, it was certainly not for the Japanese. Updates will continuously be corrected, last Updated: May 08. 2015.